In December I met this super creative bride who has written an awesome blog on how to create Photo Books. She created her own and did a fantastic job and was nice enough to put together this great article on how to create your own Wedding Photo Book. Here is a link to her Photo Book Blog. Check it out often as she often runs great contests to win free Photo Books! As a DIY bride who made my own invitations, table numbers, and even centerpieces, I know firsthand how hard it is to come up with a realistic budget and then stick to it. One of the most important of these budget decisions involves selecting the right photographer and the best photography package to suit your needs. Every bride knows that after the whirlwind day is over, what remains is your photos and memories of your big day. Discuss with your photographer the option to obtain the high resolution digital files of your photographs so that you can make your own wedding photo book. Additionally, many photographers include an e-session or engagement photo session prior to the big day, to give you a chance to get more comfortable interacting with your photographer and to get more comfortable being in front of the camera. My fiance (now hubby) and I showcased these e-session photos in a custom photo guest book for our wedding guests to sign. You don't have to be a designer to make a beautiful album. It was very easy to do using the free design software provided by the photo book company, and an easy drag-and-drop interface. The guest book was a big hit and our guests filled it with personalized messages. A standard guest book will probably get put at the back of your closet, while a photo wedding guest book will be fun to look through even years down the line. 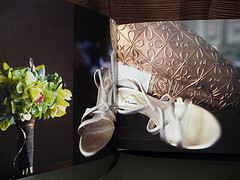 As for options for your wedding album, there are many. You can get a high-quality one for as little as $30 for a 20-page 8.5 x 11" hardcover book, all the way to $250.00 to $450.00 or more for a premium leather bound flush mount photo album. More affordably priced photo books make great gifts for parents albums or for the bridal party, while the bride and groom will likely opt for a premium style. The lay flat photo book is bound in a special way that allows its pages to lie flat. The pages stay open without having to hold them down, which gives it a premium look. This format also typically allows you to stretch a single image across both pages of the spread, providing a sweeping panoramic visual effect that showcases your best photos. 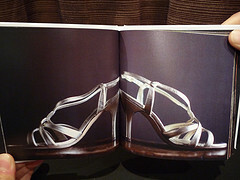 Lay flat books are also available printed on thick, genuine photo paper - which also adds to the quality. The flush mount album is a type of photo book that lies flat. Flush mounts are printed on real photo paper and mounted on a hard board type backing which makes the pages feel extra thick. They are generally bound in a leather case and are pricier than regular lay flat photo books, but you do get what you pay for. Due to the thickness of the pages, they generally come in limited page counts of about 20 to 30 pages. Until recently, these options were only available to pros, but now many companies are offering these options directly to brides and grooms. If you're a little intimidated, don't be! Many companies offer free books to try their service so you can do a trial run with your vacation photos or family photos for instance, before trying to make your own wedding album.